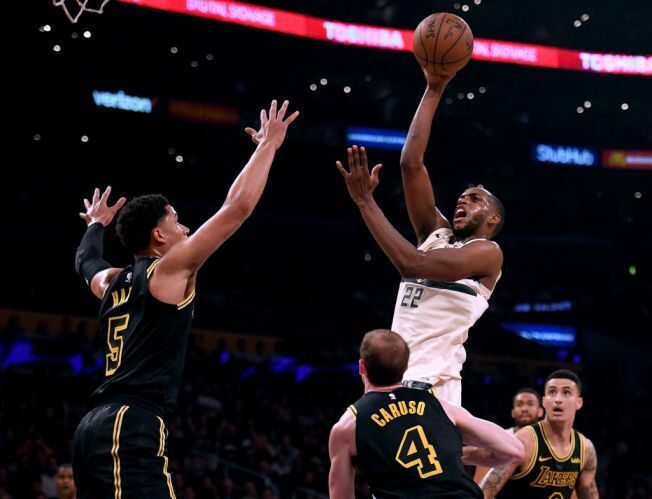 Kentavious Caldwell-Pope scored a season-high 35 points, but the Los Angeles Lakers lost their fourth consecutive game, 115-101, to the Milwaukee Bucks on Monday night at Fiserv Forum. Khris Middleton #22 of the Milwaukee Bucks takes a shot. On a starless night in Milwaukee, the Bucks proved they were the better short-handed team. Both teams went to battle without their superstars. The Lakers were without LeBron James, who missed the contest with a sore left groin, and Milwaukee was without MVP candidate Giannis Antetokounmpo, who missed the contest because of a right ankle sprain. Each team was undermanned, but the Bucks played with just eight players, and proved that without their biggest star, they were still the more-balanced team. Khris Middleton led the Bucks with a team-high 30 points, 10 rebounds, and five assists. Former Laker Brook Lopez had 28 points, nine rebounds and five three-pointers. Nikola Mirotic chipped in 23 points. Milwaukee had 15 three-pointers in the game. Caldwell-Pope nearly had 15 three-pointers by himself as the Lakers' sharp-shooter knocked down eight long balls in the game. "We've seen him do that before," said Lakers' head coach Luke Walton of KCP. "We've seen him shoot the ball like that in practice, he's a very skilled shooter. It's a lot of fun when he's having a game like that." "It felt like everything I threw up was going to go in," said KCP of his hot-shooting. Kyle Kuzma had 17 points. Reggie Bullock had 13 points and Rajon Rondo also had 13 points to go with his 10 assists. "We fought and hard played hard with the cards we were given," said Kuzma. "That's all you can ask for." Milwaukee led for most of the game, taking the lead early in the first quarter and never looking back. The Lakers tied the game at 56-56 late in the second quarter, but the Bucks extended the lead to 23 in the second half, thanks to blistering shooting from beyond the arc. "KCP [Kentavious Caldwell-Pope] had a great game, other guys did some of the little things to give us a chance to at least stay in the game," said Walton. "That's a good team, they have the best record for a reason." The Bucks have their sights set on a home-court advantage throughout the NBA Playoffs as they possess the league's best record at 53-18. Meanwhile, the Lakers are on an elevator headed down to to the basement as they fell to 31-40, nine games below .500, and an idential record to which they had at this point last season without James on the roster. LeBron James (groin), Lonzo Ball (left ankle sprain), Tyson Chandler (neck stiffness), Lance Stephenson (illness) and Brandon Ingram (shoulder) all missed the game due to injuries. Giannis Antetokounmpo (ankle), Sterling Brown (wrist), and Malcolm Brogdon (plantar fascia) all missed the game for Milwaukee. The Lakers head back to Los Angeles where they will host old friend D'Angelo Russell and the Brooklyn Nets on Friday night at Staples Center.